This post is written by contributing author Angela Hamilton. Happy December! 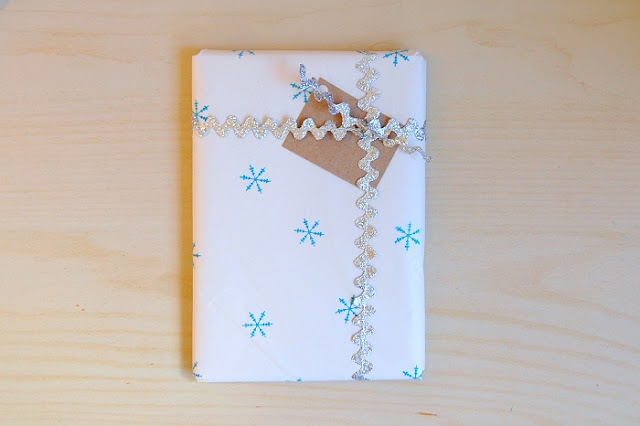 I couldn't be happier to present a post on gift wrap in the very beginning of this month. Are all your gifts ready for giving? Any of them? I decided to wrap my rigid items with this paper as it's the perfect size. In the above photo, I used a foam sticker that I had no use for and stamped it in my ink pad for a sponge-like effect. 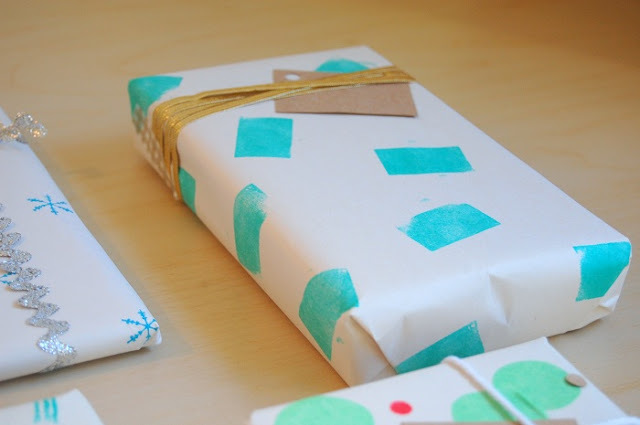 To make confetti wrap, simply cut circles into tissue paper and use a hole-punch for smaller dots. Just dab glue from a glue stick lightly onto the paper so it doesn't wrinkle. I adorned my packages with simple kraft paper tags and cotton yarn. 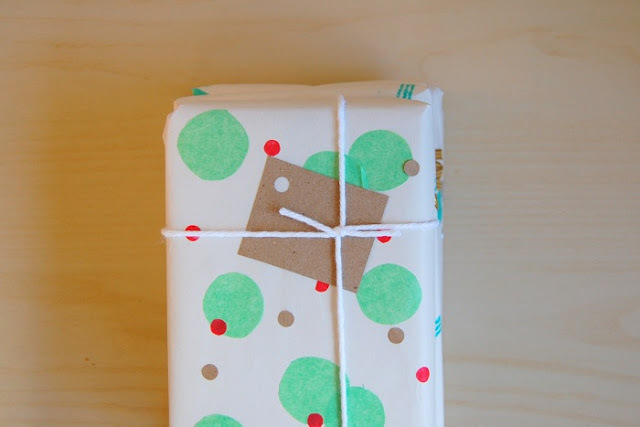 Ric-rac is probably my #1 favorite supply for gift wrapping. Try a few thrift shops and you'll likely score some unique vintage sewing notions, including similar ribbon. I used to collect some from a shop in my college-town. The snowflakes are simply stamped right on the paper. adding secondhand ornaments or embellishments to your gift box or bag. Have you made your own wrap this year? Leave a link in your comment to inspire others! Happy holidays! Angela Hamilton is a writer and crafter from the Pacific Northwest, and a recent college graduate who blogs about creativity, her adventures alongside her Nikon, and her thrift-shopping, list-making lifestyle. She is currently striving to find a balance between working full-time in an office and following those distant dreams of writing and making things every single day. Her blog is Garden & Sea, and she runs both a vintage shop and a crochet shop on Etsy. 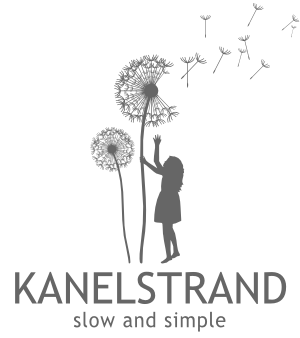 Connect with Angela on Twitter. I heart the twinkly rik rak! All the packages look awesome! Wow ... beautiful! 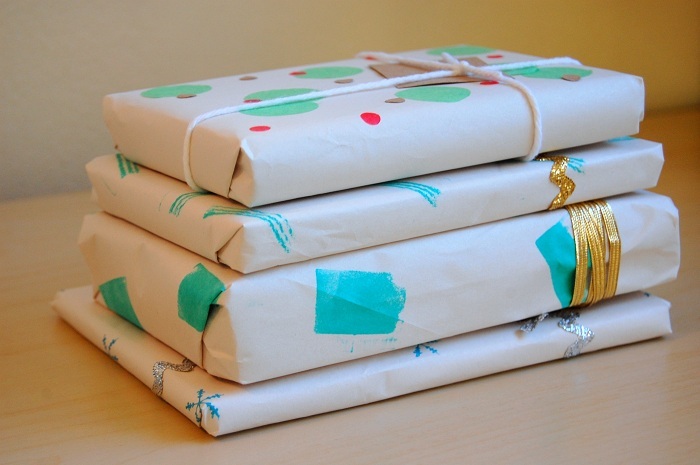 It would be really hard to toss out that wrapping ... it's more like art! :-) Thank you for sharing! These are really lovely and glad you shared! What cute ideas! I use kraft paper as gift wrap sometimes, and decorate it for whatever occasion the person is celebrating. This is a cute idea! Thanks for sharing! Kraft and packing paper are as humble as they are versatile.